Make Power-over-Ethernet-capable Gigabit network connections. The C6PATCH6BL 6ft Cat 6 Patch Cable meets or exceeds all Category 6 cable specifications to ensure reliable Gigabit network connections, and features a durable blue PVC jacket that enables you to color code your network cable runs as needed.To ensure long-lasting performance, this high quality Cat 6 patch cable features molded PVC strain relief that prevents the RJ45 connector termination points from bending at sharp angles - reducing the risk of cable damage, which could decrease network performance.StarTech.com Cat6 cables are manufactured using high-quality copper conductors. 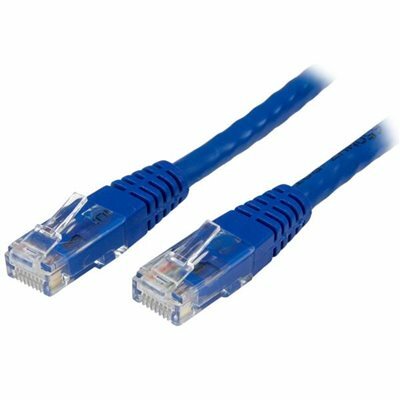 While many cable manufacturers offer a "cheaper" cable, based on a copper-coated aluminum core, StarTech.com makes no compromises on quality to ensure you receive top value and performance for your network cable investment.This Cat6 cable is constructed with 24 gauge copper wire, to support a broad range of Ethernet applications such as Power over Ethernet (PoE). Because StarTech.com uses a high quality copper wire, StarTech.com cables easily sustain the power required for Power over Ethernet applications, whereas the inferior quality offered by copper-coated aluminum cables may be subject to insufficient power delivery, heat buildup, equipment damage and potentially, fire.This molded patch cable offers high quality connectors comprised of 50-micron gold, to deliver optimum conductivity while eliminating signal loss due to oxidation or corrosion.